When fresh corn is in season, I usually do nothing more with it than pull off the husks and silks and boil the ears. Simple corn on the cob is hard to beat. But, I had this little number waiting patiently on my Recipes to Try board on Pinterest. It’s from last September’s issue of Bon Appetit, and the recipe is online. 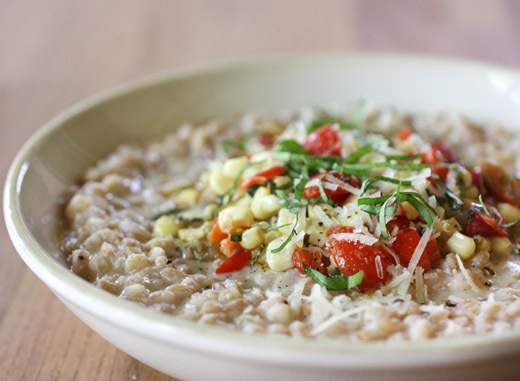 It’s like a risotto except that it’s made with farro instead of rice. The fresh corn is used in two ways in the dish. First, corn kernels are cooked with onion in a vegetable broth and then pureed. The puree is stirred into the cooked farro to give it the lovely texture of a risotto. Second, more corn kernels are cooked with chopped bell pepper and tomatoes for a pretty topping for each serving. Adding to that risotto-like texture is grated parmigiano cheese that melts into the tender farro. I can’t believe I’m going to suggest this because when do I ever turn down cheese especially parmigiano, but the corn puree is so flavorful all on its own, you could easily skip the cheese and make this a vegan dish. It was light and more clearly about the corn with just the puree, but with the cheese there was added umami, of course, and richness. Either way, you can’t go wrong. The first step is to cut all the corn from three or four ears. Chopped onion was cooked in olive oil in a saucepan until translucent, and then one and a half cups of the corn kernels was added with some salt. When softened, vegetable broth was added and left to simmer for about 20 minutes. After the broth had reduced, the mixture was allowed to cool before being pureed and strained through a sieve. Meanwhile, the farro was cooked in vegetable broth and water until tender and then drained. Next, finely minced onion, and I added minced garlic as well, was sauteed in olive oil in a large skillet. Diced bell pepper and the remaining corn kernels were added. Going back to the cooked farro which was returned to a large saucepan, the corn puree was added while stirring. Grated parmigiano cheese was then stirred into the farro, and if it seems dry at all, more vegetable broth should be stirred in as well. Last, chopped tomatoes and basil were added to the corn and bell pepper saute, and that mixture was spooned on top of servings of farro. More parmigiano and basil were used as garnish. This is a deceptively healthy dish given the hearty nature of risotto or farroto. The chewy whole grains of farro and all of those summer vegetables don’t come off as so prudishly good for you in this format. 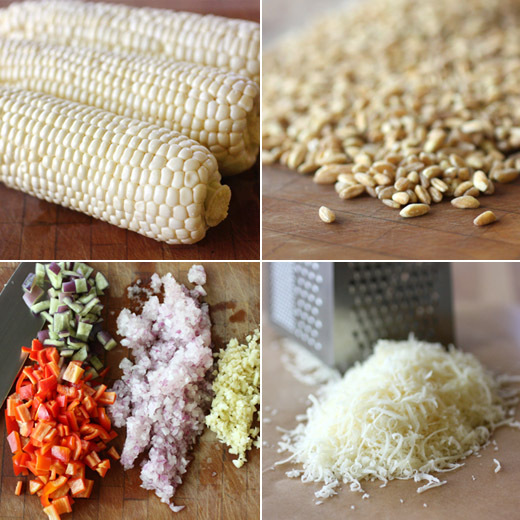 It was well worth taking an extra step or two in prepping that fabulous, fresh, summer corn. That is one original recipe! I'm sure this beautiful dish is extremely tasty and enjoyable. What a great recipe, Lisa! I love farro but usually don't take the time to actually cook it like this. The flavors are wonderful... and what a healthy, nice, complete dish. And who doesn't love sweet corn... this is such a unique recipe. My favourite way to enjoy fresh corns is just to boil them in water. Yours with farro looks very nutritious and tasty! What a splendid summer recipe! I haven't been able to get enough fresh corn. I seem to purchase more at every trip to the farm stand, farmers market or grocery store! I'm now following your "recipes to try" board. I'm with you on simple corn, but every once in a while, I like to try something different. This looks good Lisa. This is certainly an interesting dish with the pureed corn mixed in. It would make it lovely and creamy. Really different recipe! Love the look of this - it's terrific. Thanks so much. What a gorgeous and unique dish! I'm always looking for new ways to highlight corn. Thank you for sharing! Beautiful summer dish - I bet this tastes heavenly! so many fresh ingredients make this SUPER appealing! This sounds like a wonderful way to showcase one of summer's best vegetables. I'm sure it would still be delicious but I would never skip the cheese :-) This dish looks beautiful! 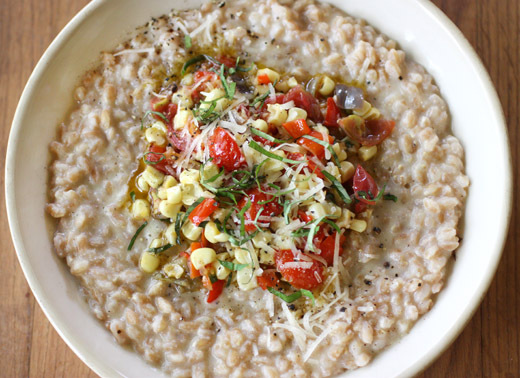 Interesting way to use farro- it looks just as creamy and delicious as a risotto. I have never come across the dish like this one. It looks beautiful and sure tastes great too. Lovely post! I wish I could get some farro to make this dish. Emmer was the wheat the ancient Greeks cultivated for millenia until 1930. For some unexplained reason it's production was banned in Greece and farmers were forced to cultivate the wheat we eat today. You can find it in stores selling organic products but it is overpriced.